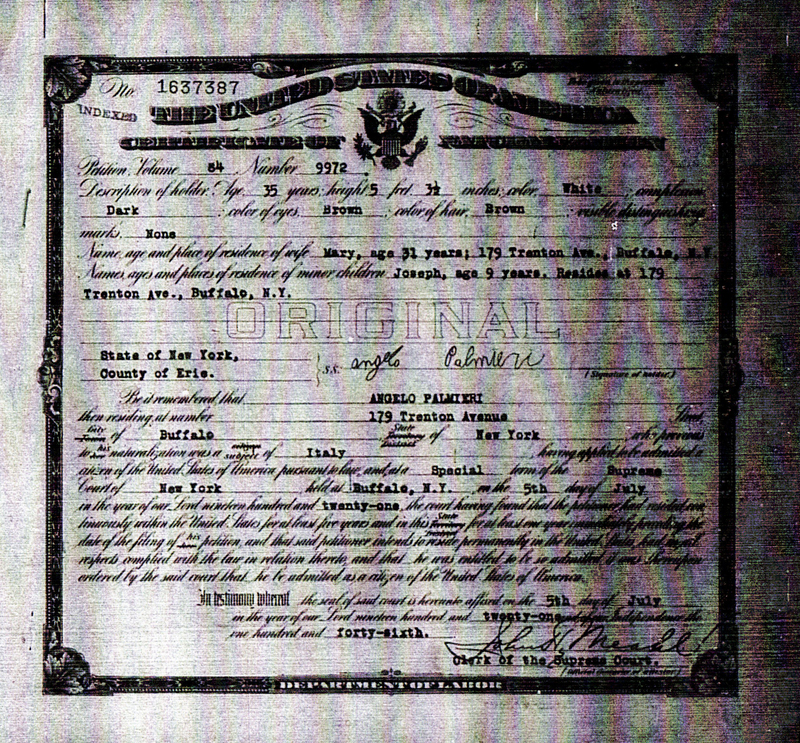 After a ton of searching, misstarts, and false alarms, my great-grandfather's naturalization papers finally arrived today. 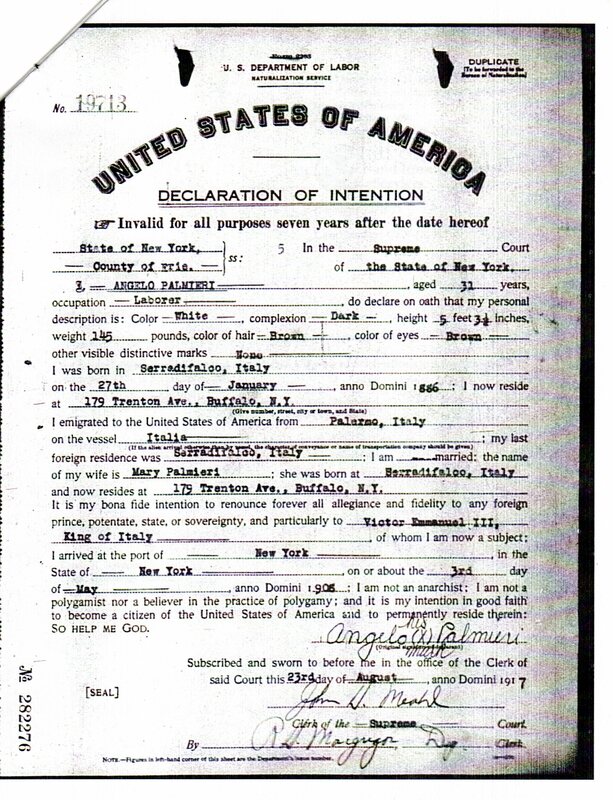 He was naturalized on 5 Jul 1921. That's 10 years after my grandfather was born in the United States. We're eligible to declare Italian citizenship. 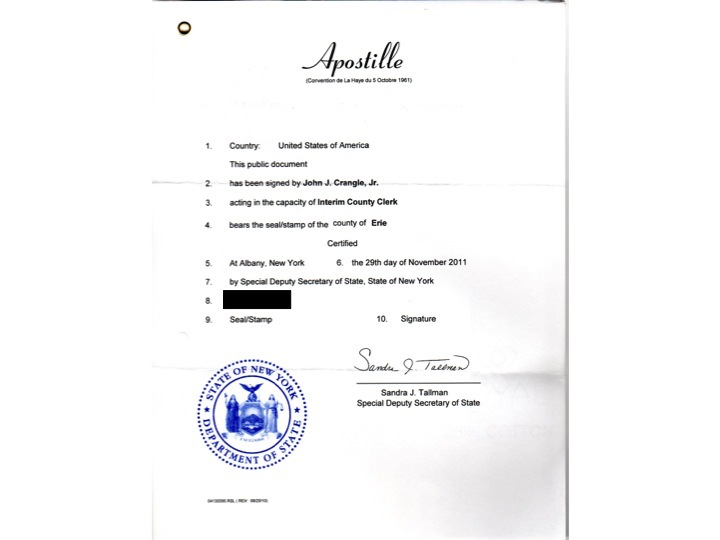 The apostille for our marriage certificate arrives from NY State. 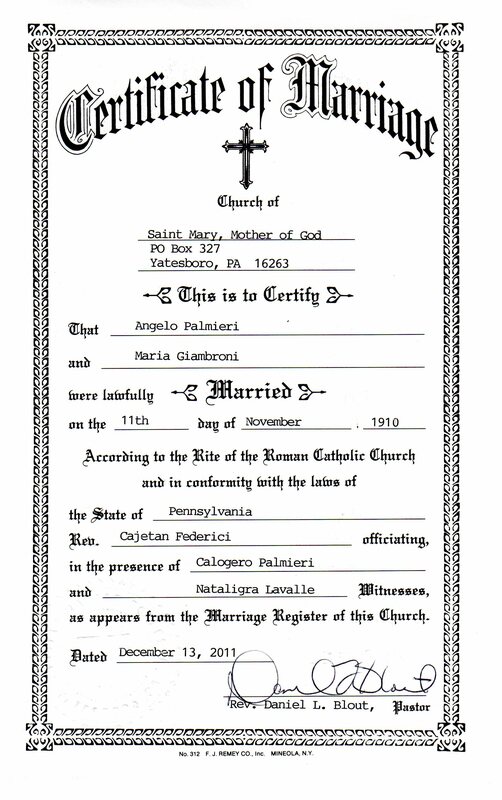 The church in Yatesboro, Pennsylvania, sent a marriage certificate for my great-grandparents, Angelo Palmeri and Maria Giambrone. 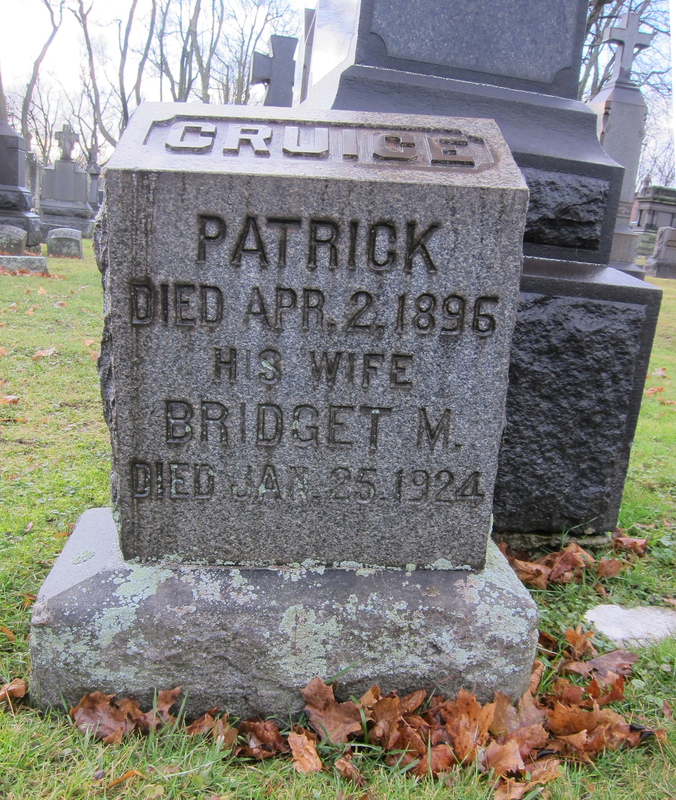 My great-great-grandparents, Patrick Cruice and Bridget Sweeney Cruice, were buried in Holy Cross Cemetery in Lackawanna, NY. I knew their death dates, but I got pictures of their graves. I also got a death date for Patrick's brother, James Cruice, who was also buried in the same plot. I'll get a copy of his death certificate from the City of Buffalo to confirm their parents' names. I don't know if these are related to my Cruice's, but the cemetery was giving my name to another person who was recently researching this same Cruice family. 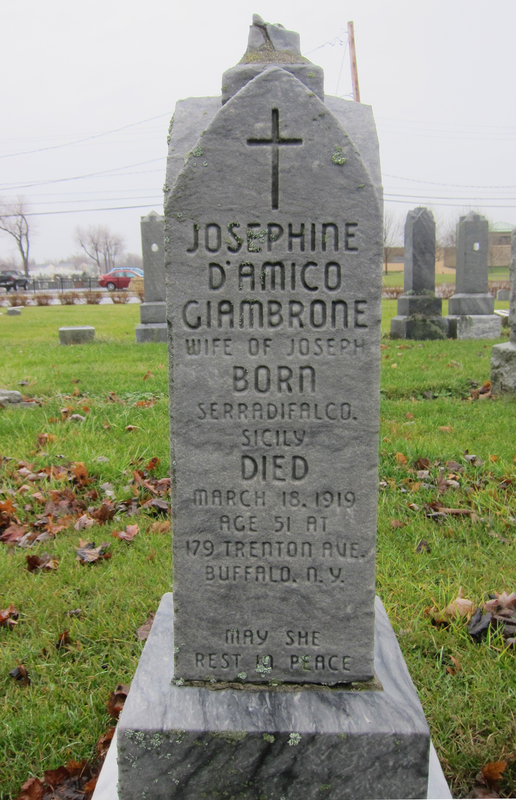 My great-great-grandparents, Giuseppe (Joseph) Giambrone and Giuseppa (Josephine) D'Amico Giambrone were buried in the United German and French Cemetery in Buffalo, NY. Both were buried in Section 18. 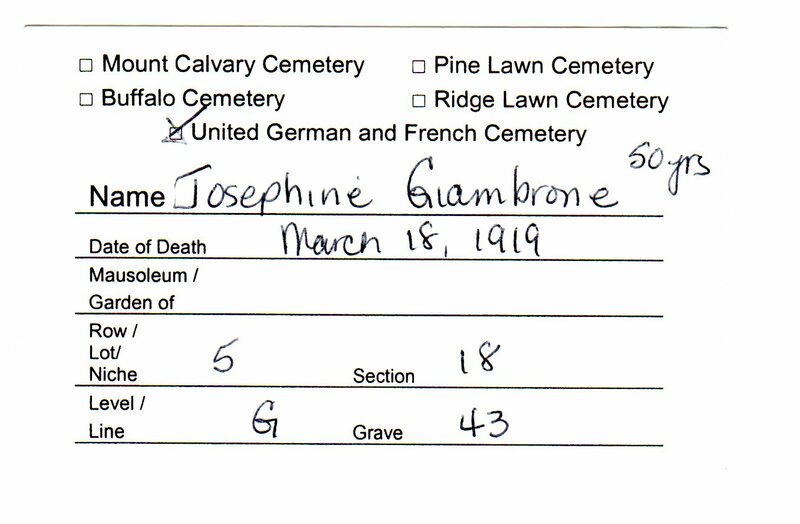 I knew that Josephine died before Joseph and that it was probably before 1920 based on her absence from the census record. From the cemetery records, I learned that she died on 18 Mar 1919 at 51 years old age. 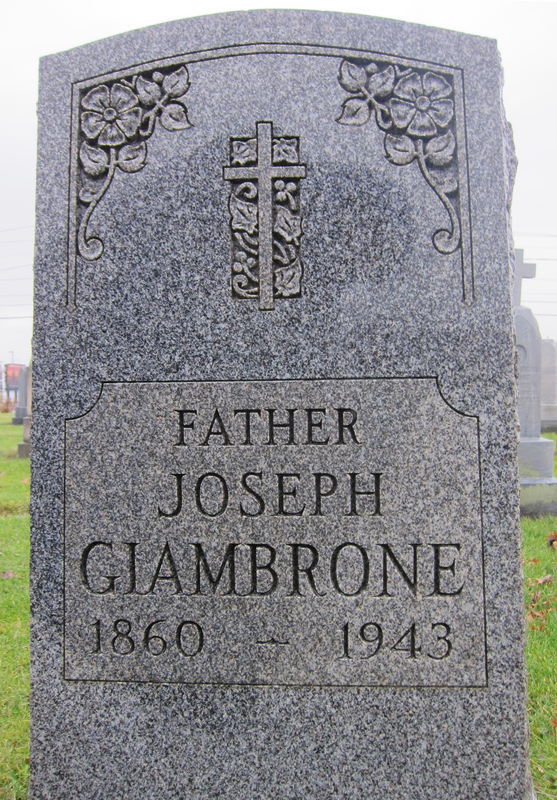 Perhaps because Josephine died relatively young, and perhaps because the Giambrone's were rather poor immigrants, she was buried in a single grave. When Giuseppe died in 1942, he could not be buried next to Giuseppa, but he could be buried in the next lot over. 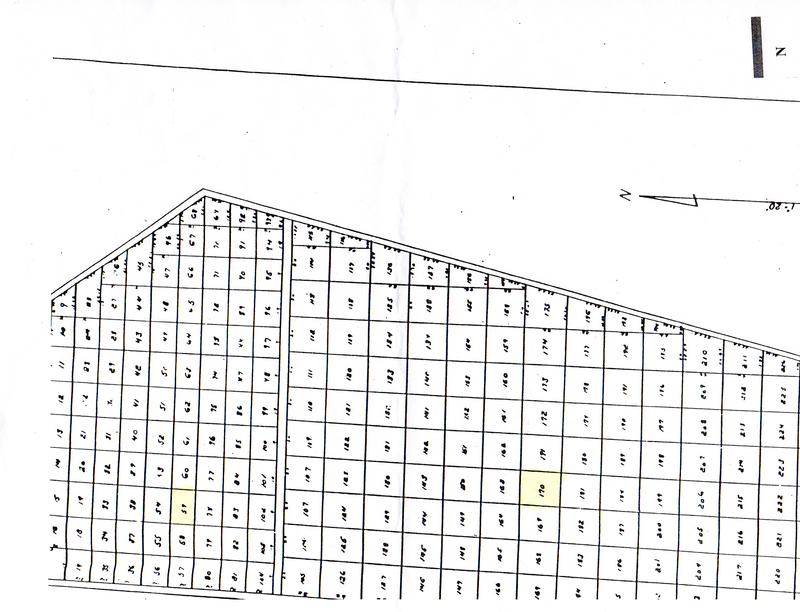 He is buried in Section 18, Lot 3, Line H, Grave 14. She is buried in Section 18, Lot 5, Line G, Grave 43. 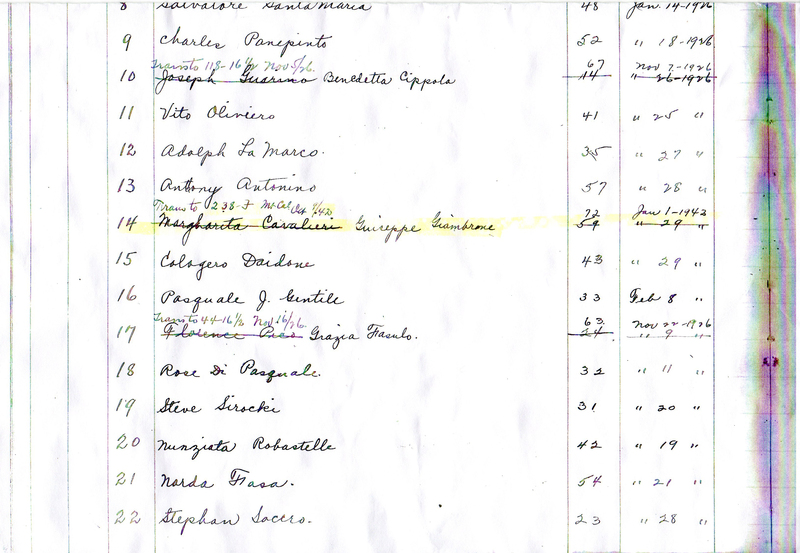 From the gravestone, I also see that my great-great-grandmother was D'Amico, not Amico. Or perhaps it was spelled both ways? I don't know if it is OK to post something that I posted on another website's forum. But, since I belong to a few (and I guess some of us to too) I thought that those who don't belong to others might benefit from this anyway. If it's against the rules, please feel free to let me know and I apologize in advance. I have posted several questions on this forum over the years and now believe it is time to give back. Anyway, I am a detailed oriented person that lead me to hours and hours of combing forum after forum looking for information on the experiences and processes people went through to amend vital records. Amending vital records by court order isn’t like most civil lawsuits and most of the self-help information was geared for suing your landlord or looking for money owed to you. So, after going through such processes, I felt it would help to post this. This is of course the last resort in vital statistic corrections – court order. I have a nightmarish issue with documents. Nine documents total are with significant errors that require amending. My meeting with the consulate resulted in this long quest to fix the vital records of my ancestors, which is underway in earnest. I have vital records from all over the United States that need amending: Washington State, Texas, Delaware, Pennsylvania to name a few. I am NOT a lawyer, NOR is this legal advice. However, since I have completed this process in a few different states now without the assistance of a lawyer (honestly, I couldn’t even get one to give me the time of day on this issue anyway), I found it to be a detailed, but straightforward, process. I also purchased a legal dictionary to become familiar with some of the terms I was reading within the Court Rules. 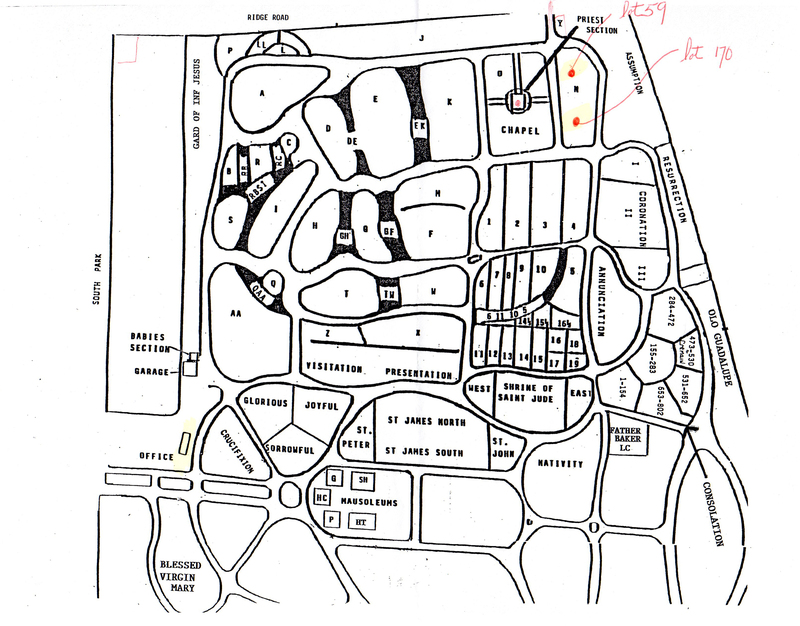 Once I knew where to file the paperwork (venue), I called the clerk of the Court (e.g. Prothonotary in Pennsylvania, Clerk of Superior Court in Washington State) that handles the paperwork and I asked for a copy of the “local Court rules.” I was able to get them sent to me by fax or mail. After receiving the local rules, I needed to know what to file. This was also outlined in the Court rules and seems that it is pretty standard. A civil suit (which is what it is called when you try to amend a vital record) begins with the filing of a complaint/petition/pleading and (in some Courts a case information sheet or form), as well as the appropriate filing fee. 6. Relief (What I wanted to happen). I kept the complaint as short as possible by giving a plain explanation of what I wanted to accomplish and what I was using as documentation to support my position. The Courts seemed not to mention anything about this so it must have been acceptable. I also attached to the complaint, only true certified copies of documents. Later, I asked (motioned) the Judge, after my motion to amend the vital record was granted, to return them. THE NOTICE (OR SUMMONS) – This is a standard form that I found in the Court rules. It’s like a form letter that officially notifies the other parties that they are involved in a lawsuit. In PA, it is called NOTICE TO DEFEND; in WA it is called a SUMMONS. So the language may vary I imagine in other states. THE DRAFT ORDER TO CORRECT VITAL RECORD – This is a draft of what I was asking the Judge (the relief) to require from Vital Records. By having a draft, it gave the judge an idea of what I was looking for and wanted to see out of the lawsuit. Even though this is also listed in the complaint, it gave the judge in the Orphans’ Court in Pennsylvania the opportunity to sign it without a hearing. NOTICE OF HEARING – This form was required for three Courts. This Notice is a form that the judge signed setting a date for a hearing at which my family and the defendant are supposed to appear. All of my hearings were scheduled one to two months after the date I filed the complaint. After I completed drafting the documents, I went to the Court to file. This is not always necessary and most filings can be done by mail, if not by fax or e-file in a select few. However, I suggest you contact the Court and ask if you can file your documents by electronic means. I received the “filing fee” by asking how much it costs to “commence a civil complaint.” It varied from $50 to $250. When I arrived, I gave the Court two copies at the desk and stamped them both. They took my money, assigned a case or docket number (which I then wrote on the documents) and then I took one stamped copy with me so I could use them for the next step. The Summons (the document of which I spoke earlier) gives the "defendant" (in this case) notice that they are being sued and to read the Complaint. Within the Summons, it gives the time limit within which the defendant has to file an answer or seek to have the case dismissed. (It was 20 days in my case; but I am sure the Court rules of the other states will say). Careful reading of this document was informative in knowing what I could be done next. The Service of Original Process was critical because it must be done a certain way. Actually, at first, I tried to mail the forms. However, after reading the Court rules more closely (because in Pennsylvania, you have to serve the papers on the Commonwealth in a special way), I had to request and pay the Sheriff’s office to serve them. If I had continued with only mailing them, I would have gone to Court for the hearing and hear the judge tell me that the Court did not have jurisdiction over the state and my case will be dismissed. Service of Original Process was actually the most expensive part of the entire lawsuit next to the travel expenses. I had to contact the Sheriff’s office of the same county in which I filed the complaint. They told me the cost and that because I was serving people outside the county, they will deputize the Sheriff’s office in the other counties to serve the papers. After I filed the complaint and sent the papers to the Sheriff…I waited. It took about 3 weeks to get the papers (or certificate of service) back from the Sheriffs. The Sheriff in most cases sent a copy of the Certificate of service of original process to the Court, as well as a copy to me. However, this doesn’t always happen so when I suggest if you call the Sheriff to serve papers, ask them what the process is to get the certificate to the Court. After throwing my 3”, three-ring binder in the corner after all this, I pulled it back out and discovered I made a mistake in one of the complaints I filed. It wasn’t a mistake actually. It was more like I left out a change that I wanted to make. So…I then had to file a MOTION. This is where you ask the Court to do something. I was asking permission to “amend my complaint.” So, I drafted a motion telling the Court what I wanted to change, why I wanted it, and what Court rule allowed me the opportunity to do it. I then rewrote my complaint with the changes. I also had to write the order for the judge. I then sent a copy to the Court and the defendants. I had to include a CERTIFICATE OF MAILING with the copy to the Court. This tells the Court that I swear that I sent the same stuff to the defendants. No reply from the defendants meant that they didn’t object. Naturally, luck was not on my side when I received notice one of my hearings was at the same time I was in Puerto Rico for vacation. To top it off, this notice was received 5 days before the hearing, at 3:30 pm on a Friday before a 3-day weekend; and I was leaving for PR the next morning. With the tickets purchased and 2 hours to get off a MOTION FOR CONTINUANCE, I set to work. A Motion for Continuance is basically a fancy way of asking the Court to reschedule something. I drafted it telling the Court why I couldn’t make it (and included a copy of my ticket receipt and itinerary for proof), and I would like it rescheduled for the next week – or the earliest available date. I sent a copy of the same to the defendants (this time by Federal Express overnight so the judge can sign the order on that Tuesday). Everything was fine and the Judge rescheduled. I had to go to all hearings in all the states except one. The hearings were generally in front of the judge and about seven to twelve other people in the public seats. The defendants all wrote letters to the judge (and sending copies to me) 15 to 20 days after they received the papers from the Sheriff saying that they didn’t object to what I was asking for and that they were not going to the hearing. This was good news because at least one-half of the people involved didn’t have a problem with what I was asking for. The first judge was very kind but very formal. 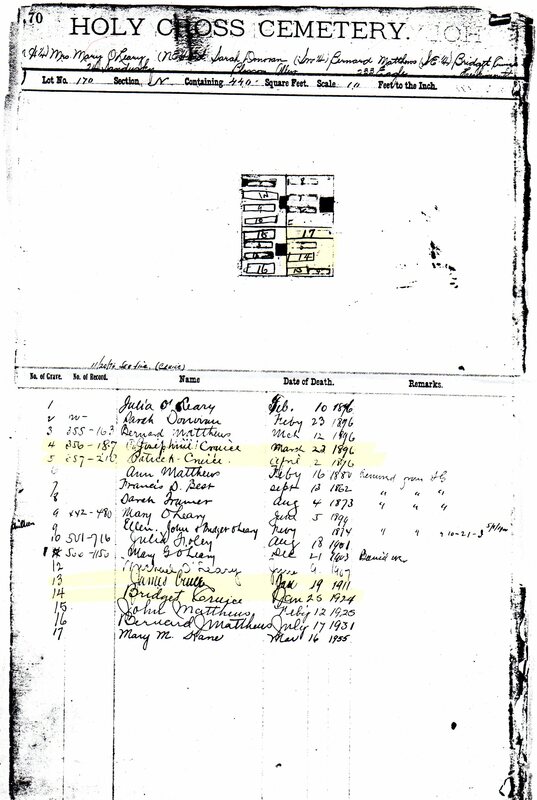 He asked many questions about how I had come to find the names and dates were incorrect, how many people in my family knew…but was really concerned about why I believe that these documents would have such errors. It wasn’t all that long…maybe 15 minutes of explaining my family history and how messed up my family was when it came to names. He finally granted me my relief and signed the order for me, and sent copies to the defendant. I also served the defendants officially by mail. Since I asked the judge to order the corrections be made within 15 days, I was receiving my corrected documents about three weeks after the hearing. Then…the process started again…As I started with the oldest document and just moved forward in line, using the previously amended documents as additional evidence in the next hearing. Just two other random suggestions…print sheets of labels with the addresses of all the people you will mail. You send a lot of post in this process so it's handy. Second, I suggest you start with the oldest document first and move forward. Lastly, change everything you can. If you have evidence to make it correct, do it. I battled between just changing the name or all the other mistakes (like missing information or something) and decided that the more I could show the judge the document was incorrect, the better chance I had at getting the change. And besides, I wanted the information to be correct since it was my family history. I of course had all the appropriate evidence to back up every claim of error or omission and wasn't just asking for stuff without proof. I hope that this is helpful to those who are kind of overwhelmed with taking on the judicial system alone. I learned a lot about our system and realized that, even though it takes a long time, it works. I included redacted versions of my documents that I used for Washington State for examples. Feel free to use them and modify them as needed. If you have any questions, please feel free to contact me. I hope this is helpful to anyone out there. I will update this as things change with my other court cases and as I have time. I chose Adams County since the rules allowed me to choose anywhere to file and Gettysburg was a nice quick drive from where I live. I had to go to Luzerne County to do the marriage as it was a document from that court and only that court could change their document. Same as above with Pennsylvania Court on marriage. I could have consolidated them all in one batch, but I am doing this also for genealogical purposes so it was a good excuse to do more research and travel to see the family homes and graves. I had to visit all states except one case in Washington State. I was able to do that hearing by telephone (at my expense of course). In some Court Rules, there is the possibility to motion for hearing by telephone. So, if you comb through the rules, you may be able to do it. And…if nothing else, you can always motion the court and ask permission I suppose. I know that many on here dealing with PA do Philly because it is electronic filing. But it really is just as easy to call the court and ask if you can file by fax and follow up with a posted original. Let me say that I have never come across a case where someone didn't have to go to court (or at least make arrangements to be heard by telephone). Electronic filing doesn't mean "trial by e-mail." So just keep that in mind. I suggest that if you review the court rules of a particular state and can file anywhere, file as close as you can to where you live and/or in a small tiny county. You move faster (less cases) and they are a little more accommodating to your lack of knowledge. Again, I am not a lawyer or a member of the legal profession. My advice is based on research and experience only of myself. You decide for yourself what actions you do or do not take from my advice. It is just a blog of my experiences. I will be applying for dual citizenship through the Detroit consulate. I heard that I needed to get documents validated by the consulate governing the state that issued the documents. That means sending the NY docs to the NYC consulate and the Pennsylvania docs to the Philadelphia consulate. – original Long Form certificate legalized with Apostille, translation in Italian and a set of copies; (should you choose to have a representative to come in, please provide a Power of Attorney specifying the purpose of your request and attach a copy of your passport). On that day, you will be required to pay the legalization fees. – the attached form filled out and signed by you in front of a Notary Public. do hereby declare that I assume all responsibility for the mailing of my original documents. I understand that the Consulate General of Italy in New York is NOT responsible for the loss or damage of my documents in transit. I therefore wish for my documents to be mailed back to me via the pre-stamped envelope that I have provided including a photocopy. I followed these instructions (even included a copy of this email with notes directing the reader to the corresponding tab for each required document I enclosed). As you can see you must send in the original doc, and hold NY harmless for its loss. That's ominous, but I did it anyway. I didn't want to send in my credit card number without knowing the fees, but they have not responded to my follow up email on this matter. FWIW, both SF and NJ quote a fee of $8.50 per original document page. They accepted money orders for the validation. I didn't know about the other requirements described above so I stapled the translation pages together and just clipped them to the original. Hope that doesn't hurt me. BTW, the SF consulate received my docs last Thursday, and I saw via USPS tracking that they have mailed my docs back to me already! That's a 2 day turnaround. NJ said they would turn it around in a day or so too. Don't know about NY. I only submitted one doc to them. Today we celebrated Christmas with my family. 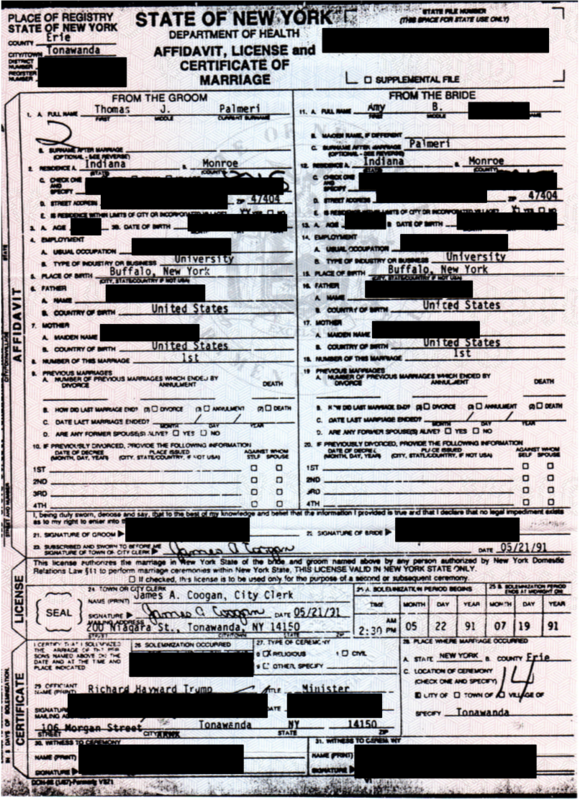 I took some time today to search through my dad's records and found an official copy my father's birth certificate, my mother's death certificate, and my mother's birth certificate. I had a photocopy of my mother's birth certificate, but I thought I would need to get a court order to obtain an official copy with a raised seal. Assuming I can get this version apostilled, no court order may be necessary. I also found a copy of my parents' marriage certificate, but it was a short version, not the long form. I will going to the Town of Tonawanda town hall with my dad to get a long-form copy. My great-grandparents' marriage certificate arrived today. 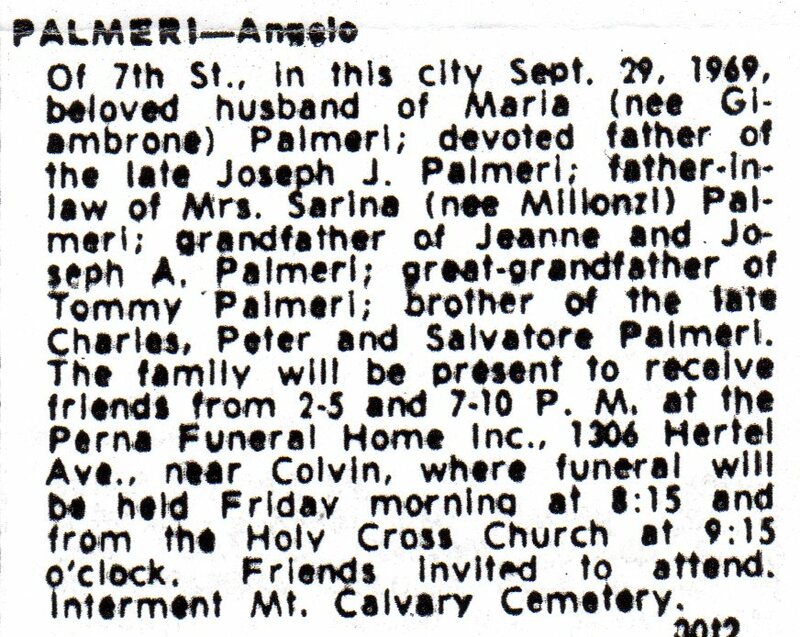 My great-grandfather, Angelo Palmeri, was 25 years old. My great-grandmother, Maria Giambrone, was 19 years old. They were both living in Yatesboro. 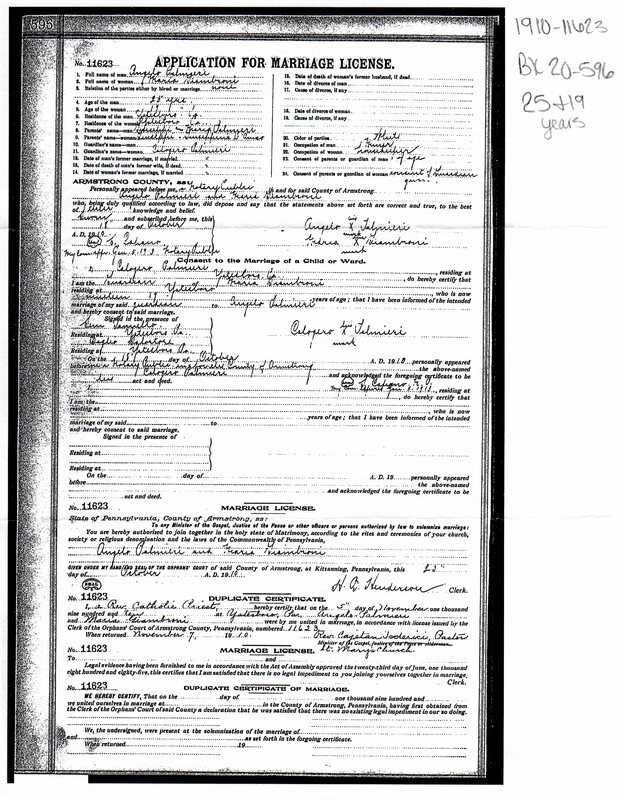 My great-grandfather's brother, Calogero Palmeri, was the guardian for my great-grandmother (apparently, 19 was not of legal age in Pennsylvania to marry without permission). He was married to Barbara Giambrone, Maria's older sister. 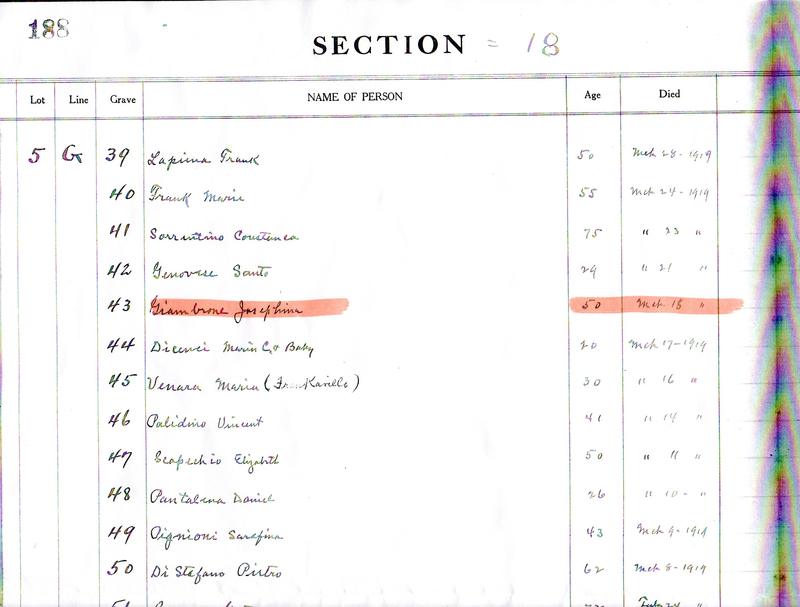 It lists my great-grandfather as a miner and my great-grandmother as a housekeeper. They were married on 5 Nov 1910 in Yatesboro in St. Mary's Church. Salvatore Baglio (probably the brother-in-law of Angelo and Calogero's brother Peter) and Sam Iannello (probably the brother-in-law of Angelo and Calogero's brother Salvatore) were witnesses. 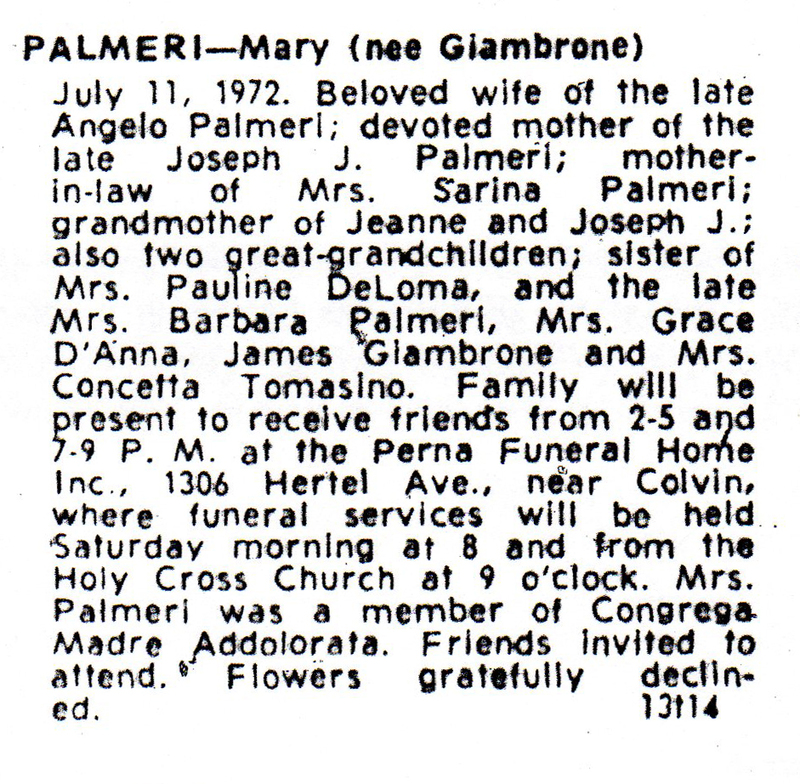 Unfortunately, my great-grandfather's name is misspelled Angelo Palmieri and my great-grandmother's name is misspelled Maria Giambroni. I guess I will be needing to do a court appearance in Pennsylvania sometime too. Ugh. But it's so clear that they were illiterate. Note that they all signed the documents with an X. It says "his mark" and "her mark". Last week, I emailed several churches in Buffalo in order to find a record of marriage for my great-grandparents, Angelo Palmeri and Maria Giambrone. NY State said they had no record, but they also said that marriage licenses were not required until a few years after my great-grandparents were married. 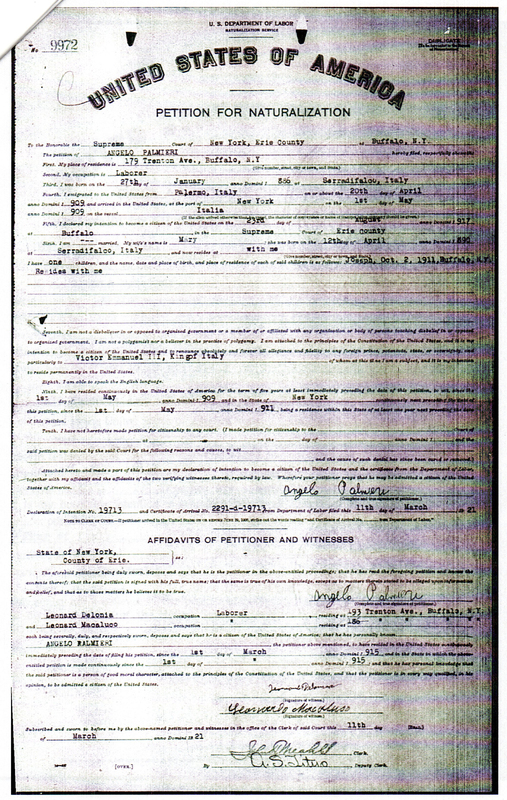 We received your request for a copy of your great grandparents, Angelo and Maria Palmeri’s, marriage certificate. You wrote that your great-grandparents were married around 1910. Our records begin in 1914, when our parish was founded, so your great-grandparents marriage record is not here. I did some research. 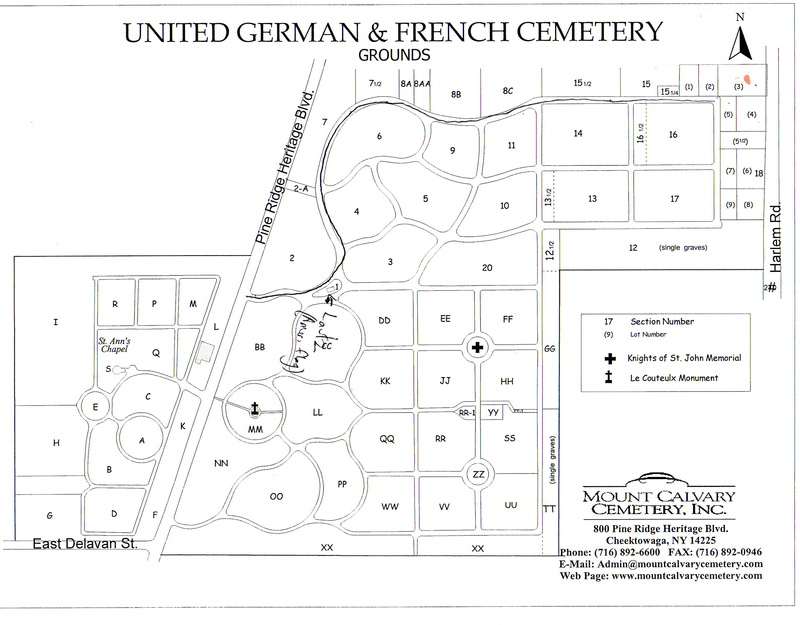 Our records show that your great-grandfather was buried from here. Having the date of death, I was able to find his death notice in the Buffalo Evening News. 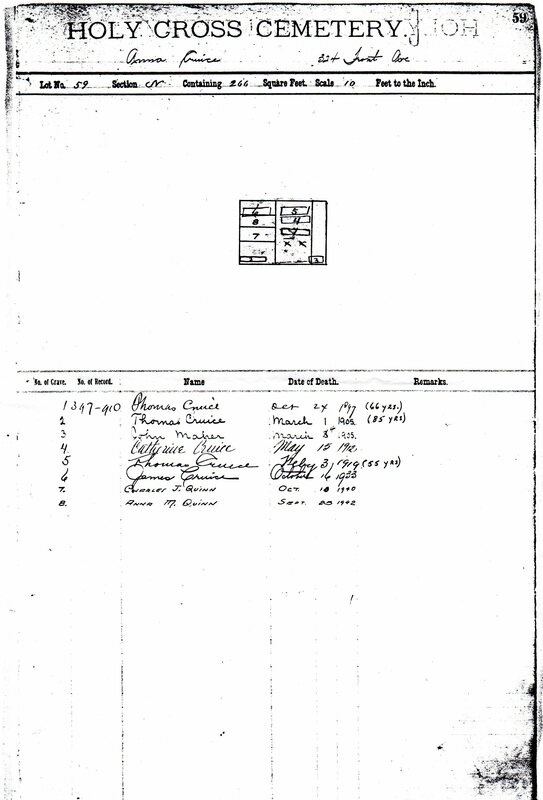 Then having the names of his siblings, which were listed in the death notice, I was able to find his listing on the 1910 U. S. Census. With this information, I located your great-grandparent’s marriage record. It was in Saint Mary Mother of God Catholic Church in Yatesboro, Pennsylvania. I called the Saint Mary Mother of God parish office and told them to send a copy of the marriage certificate here. When we receive it, we will mail it to you. Your great-grandparents were married on November 11, 1910. I will also be contacting (again) the Armstrong County clerk to see if they have an official copy. Then I will need to get them apostilled. A few weeks ago, I realized that the marriage certificate we had wasn't our official marriage certificate, but a marriage document from the City of Tonawanda. Only an official marriage certificate can be apostilled. Today I received our official marriage certificate from NY State. 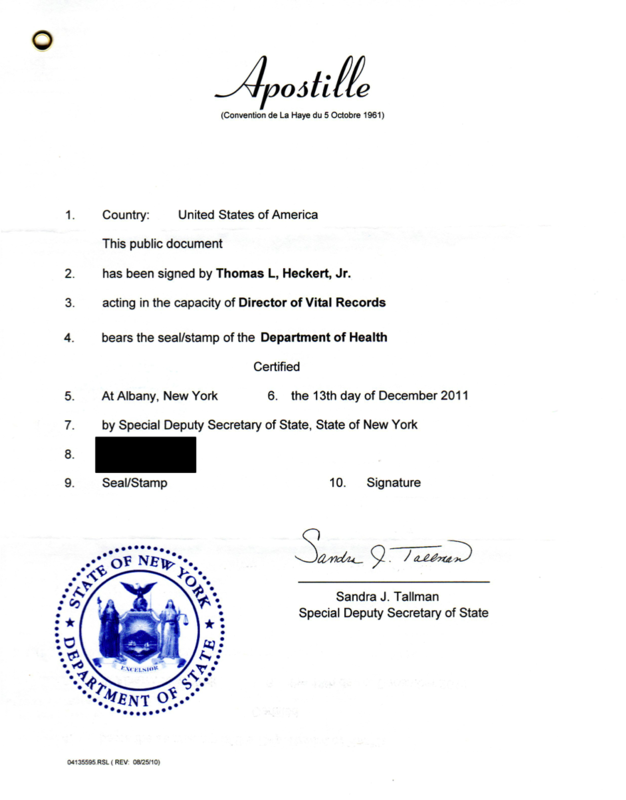 Today we finally received apostilles for our birth certificates from NY State. Another category nearly complete. Just need to get these translated.